A great BBQ dish with a fantastic spicy sauce. The sauce is perfect for the beef and our BBQ guests couldn’t get enough. Incidentally, if the meat is quite fatty then trim some off the large bits, and cut them into little squares. Then instead of throwing them away, thread them onto the skewers at irregular intervals. This will keep the meat really juicy on the BBQ and create lots of smoke which will make the beef taste even more fantastic. Cut the beef into small cubes (about 2cmx2cm). Combine turmeric, cumin, fennel lemon, salt, sugar and coconut cream and stir well to dissolve the sugar. Add the beef and coat it well with the marinade. Cover and refridgerate for at least an hour. The longer the better. Soak some wooden skewers in water for an hour, then skewer the meat on, leaving about 5cm at each end. Cook on the BBQ until the meat is charred slightly on the outside and juicy on the inside. Mix the tamarind paste with 3 tablespoons of warm water and set aside. Heat 2 tablespoons of the oil in a wok, and cook the peanuts until they are just turning golden then quickly remove with a slotted spoon. Leave to cool. Once cool, place in food processor and pulse into a coarse breadcrumb consistency. You can also do this in a pestle & mortar or with a hand blender. Soak the chillies by covering in boiling water and leaving for 20 minutes. Then remove and add to a bowl, together with 3 tablespoons of the soaking liquid, the onion, garlic and shrimp paste. Blend with a hand blender or food processor until you have a smooth paste. Heat the remaining 3 tablespoons of oil in a wok over a moderate heat and fry the onion mixture for 3-4 minutes until it turns golden, stirring constantly. Remove from heat and stir in the tamarind mixture, sugar, salt and coconut cream and set aside to cool. Once cooled, stir in the peanuts and serve. 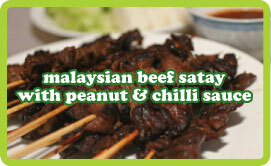 Serve the skewers of meat with chilli & peanut sauce on the side. You can make the sauce days in advance and stir in the peanuts at the last minute.